Surprising research on what sales winners do differently. What do winners of major sales do differently than the sellers who almost win, but ultimately come in second place? Not only do sales winners sell differently—they sell radically differently than second-place finishers. Today’s sales winners harness the power of ideas. 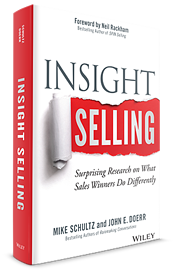 In Insight Selling, Mike and John share the surprising results of their research and outline exactly what you need to do to transform yourself and your team into insight sellers. "The majority of experienced sellers would agree that while a lot of existing sales wisdom is good, some things have become outdated and must change. The hard part is deciding what to keep, what to change and what to discard. Insight Selling lays out a convincing case for which parts of current practice we should keep, which parts must be tweaked, and which parts must be changed entirely. Whether you’re an experienced seller or just starting out in sales, you stand to learn something useful from this book." "Schultz and Doerr are truly among the elite sales thought leaders. Insight Selling outlines exactly what you need to do to set yourself apart and find yourself in the winner’s circle. It’s a must read for even the most experienced sellers." "Wow! Even your most experienced strategic sellers will sharpen their game with these insights. RAIN Group's research and application to real life situations will educate your team on how to inspire buyers with possibilities and demonstrate the value add for your offerings like never before."